This is our last block. I know most of you may be out of fabric, so you might have figured out you will just need to make one. It will be a center block that measures 18 1/2″ x 18 1/2″, then all of the other blocks we’ve made will go around it. 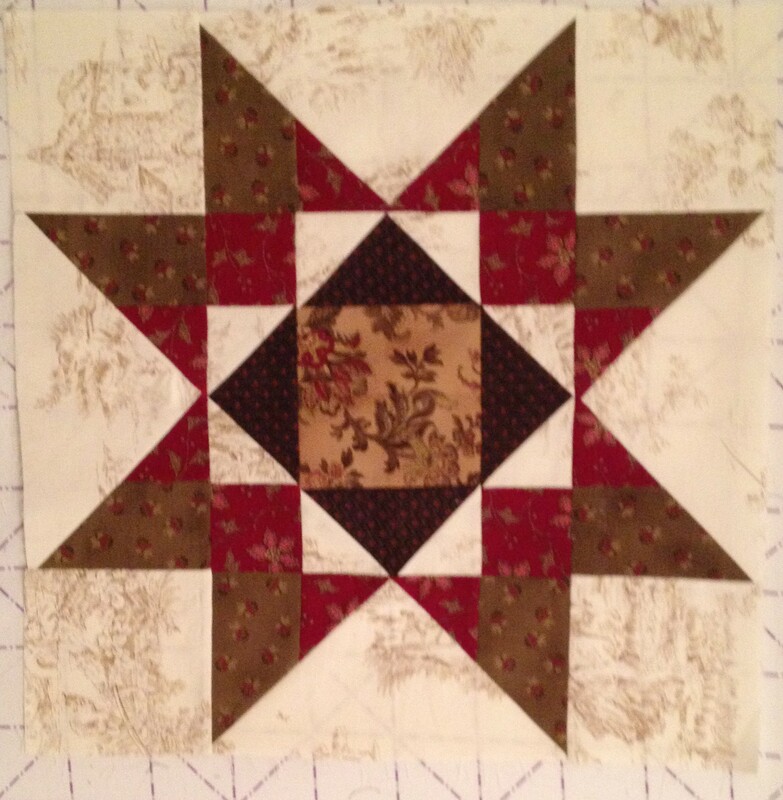 In just five days I will show you how everything goes together to finish your gorgeous quilt!! The best part… lots of options! This is a simple block. You start with a nine patch. You need a 5″ x 5″ center square, four 2 3/4″ x 5″ rectangles and the corner blocks should contrast, cut them to measure 2 3/4″ x 2 3/4″. If you’d like, you can go ahead and sew this unit together and press. 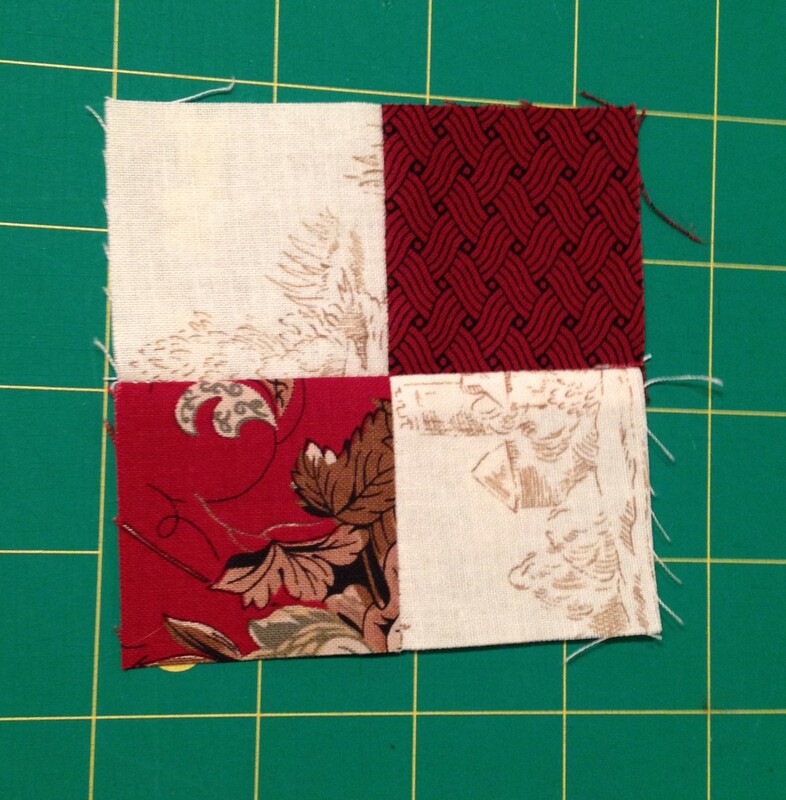 This square should measure 9 1/2″ x 9 1/2″. 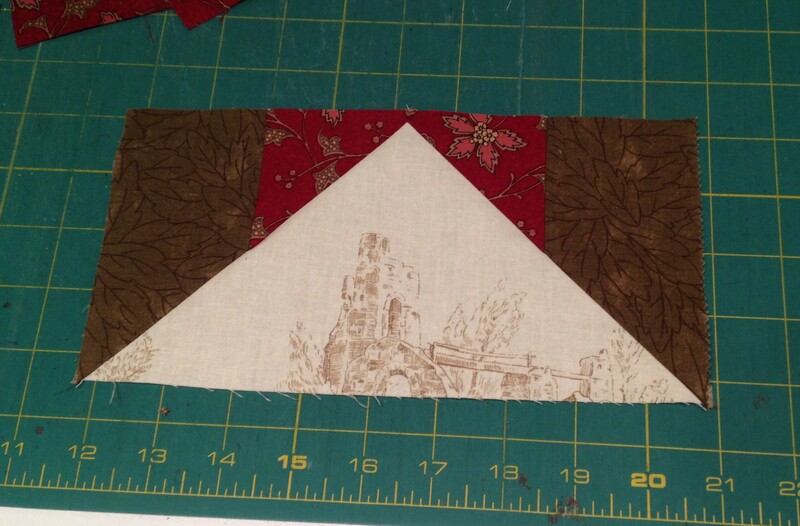 But a really nice option if you want something a little more exciting: make the rectangles into flying geese by adding 2 3/4″ squares of background to the rectangles: Draw a line on the diagonal, sew on that line. Trim seam allowance to 1/4″. Press, and repeat on the other side. If you choose this option, make all four rectangles flying geese units. The next step is to make a big and somewhat unusual flying geese unit with a strip set (you may want to read on then come back). This in an interesting technique because it finishes the contrasting squares so they circle in your block. You start with your strip set. 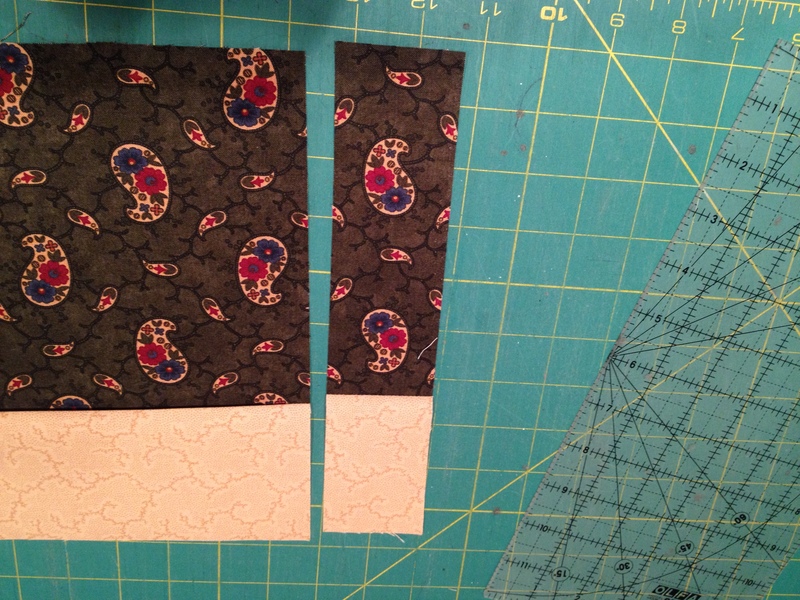 You will need a 2 3/4″ x WOF strip of the same high contrast used in the corners of the nine patch, and a 2 3/4 x WOF strip of another print (preferably dark). Stitch together lengthwise, then press. 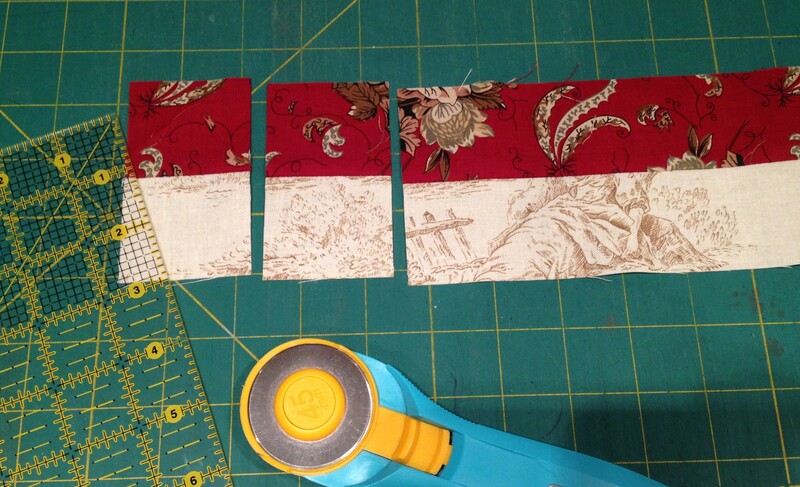 Next find your last bit of background fabric and cut into four squares that measure 5″ x 5″ and four rectangles that measure 5″ x 9 1/2″. 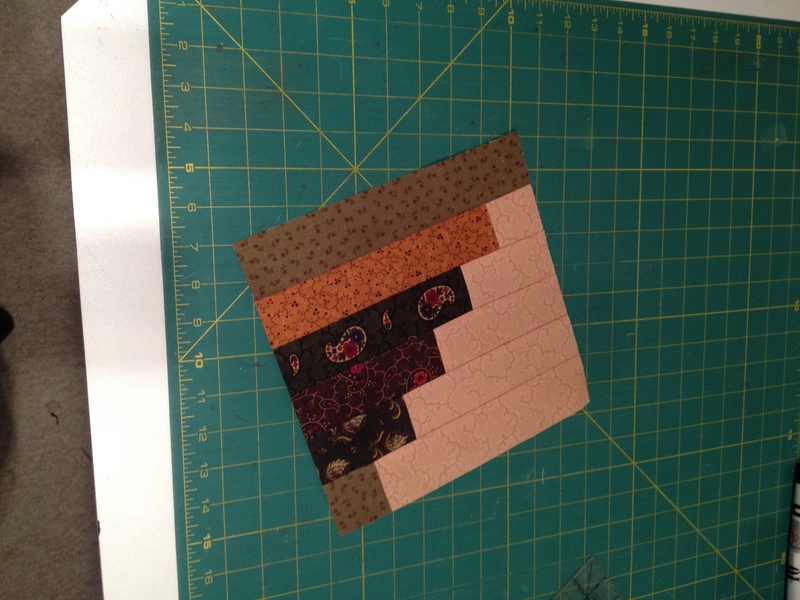 Now cut the pressed strip into eight 5″ squares. 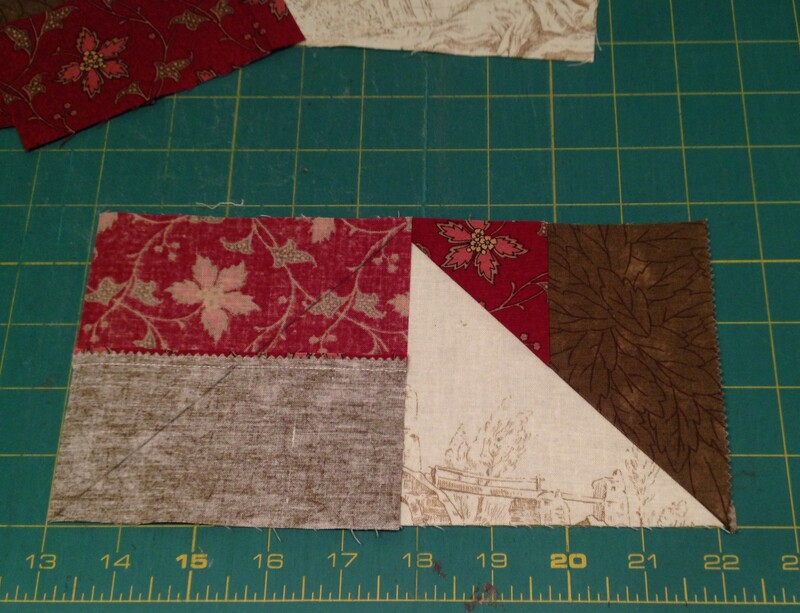 Place one of these 5″ squares on top of the background rectangle with the contrasting piece North and the dark piece South (I hope that makes sense, sometimes I find that saying “up and down” or “top and bottom” can be confusing when you are sewing. 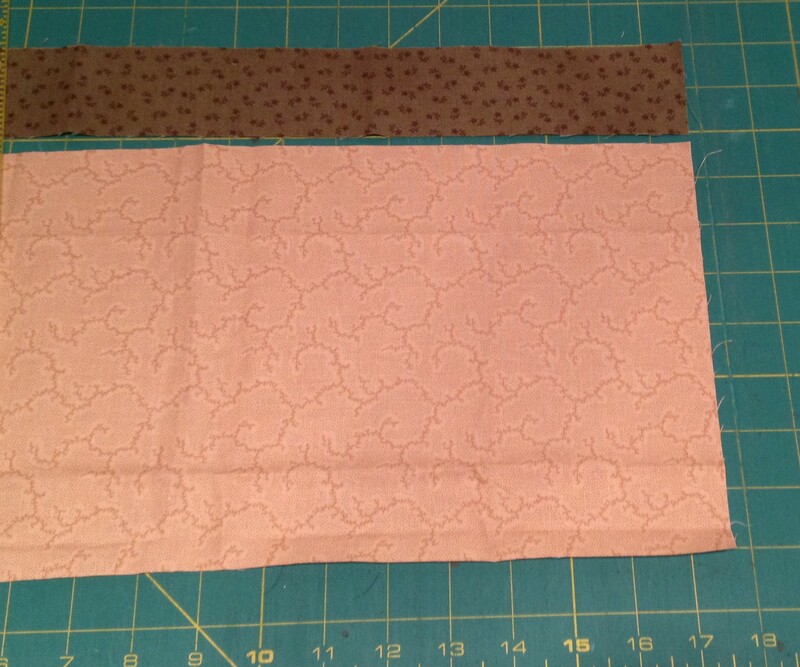 After you lay this out, draw your line on the diagonal, and sew DIRECTLY ON that line, then trim seam to 1/4″ and press. Repeat with the other side, be sure to lay your contrasting piece “North”. 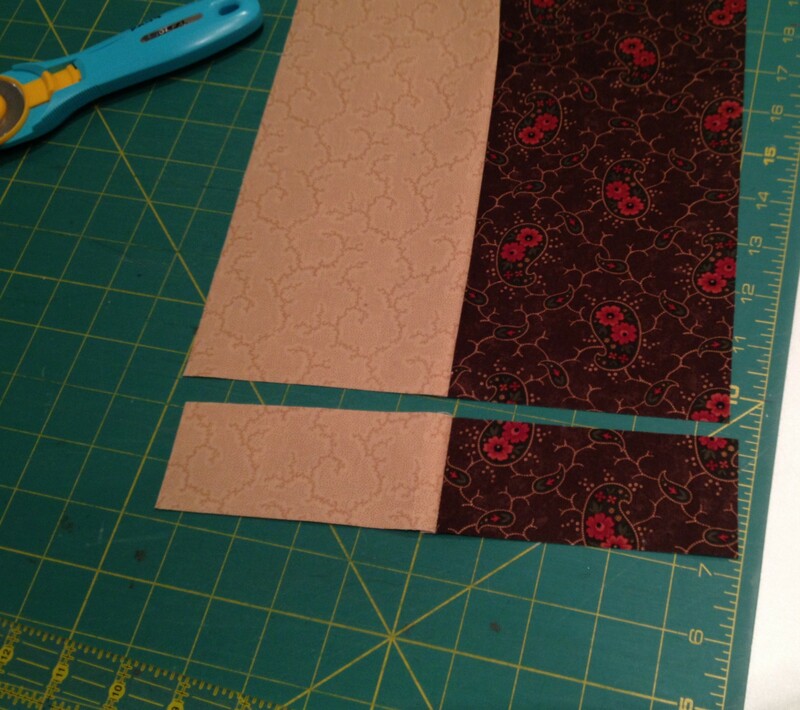 Repeat the sewing on the diagonal line, trim seams to 1/4″, press. The flying geese unit should look like this: Make four. 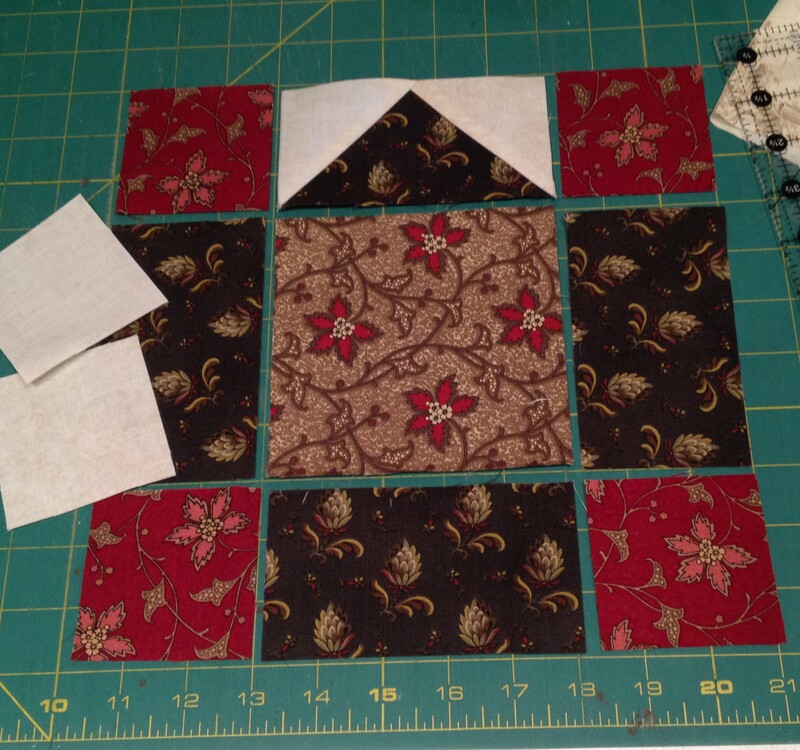 Then lay out your new flying geese units, the corner squares and you pieced nine patch to make one big nine patch. Sew together and press. Your block should measure 18 1/2″ x 18 1/2″. Super cool! This is your last block!! I will show you the completion options in five days!! It’s a brand new year!! Thank goodness!! I am almost caught up from my month of being stressed out and “checked out”. It is terrible to be non-functional when you have year end business things to do, I am on my third office day and I’m starting to feel like I may catch up this month! Whew! Thank you for all of your well wishes. Things are good. I am going to have two surgeries this spring, but they are more prevention than treatment. I should have had a different surgery two years ago but I didn’t like the plastic surgeon they sent me to and I couldn’t cope with the idea of traveling to Seattle. Now it is time to take care of things. I’m definitely ready, and tired of being freaked out by bad mammograms. Christmas was so great. We went up to the woods. Lots of snow, crackling fire, family, pinochle and no cell phones or internet. 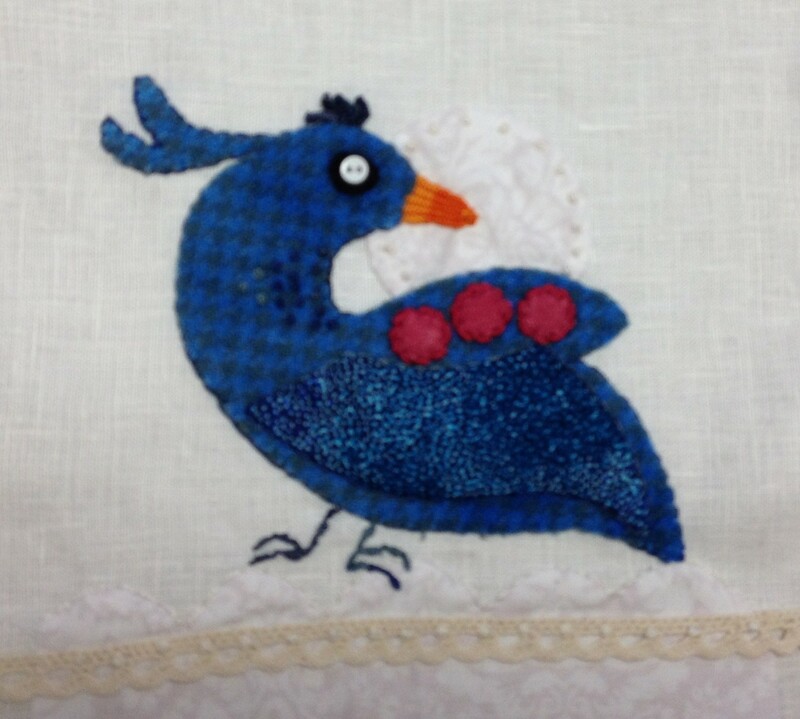 I did get a bit of stitching done, but not enough to be ready for any classes this month…. like a rebel I worked on my own things, not class things. Such a bad girl… I deserve my sleepless nights! This is one of my Bird Dance blocks. Fun BOM, we are doing three birds/month. All in wool with terrific stitches, Sue Spargo Style! Then our Prairie Women Group got together for a Christmas gift exchange. 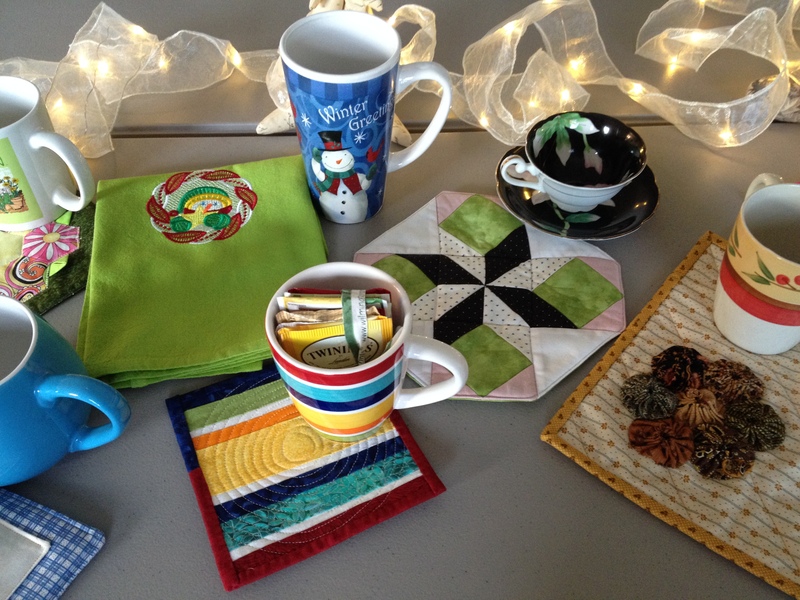 We each brought a mug/cup with a matching mug rug then swapped ‘White Elephant’ style. Super fun. Speaking of mugs… this is a mug I got from Brittany and Jordan, I LOVE it! 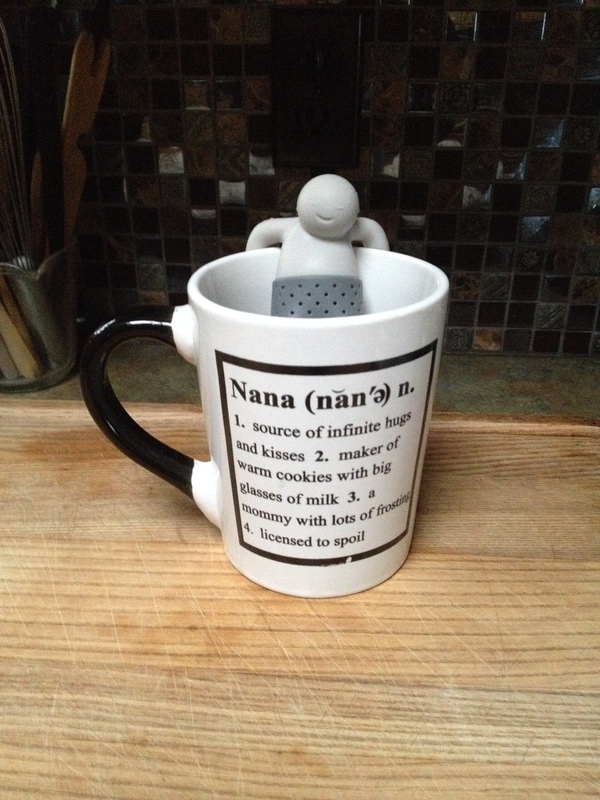 And the little dude in the cup was from Brianna, he is a tea steeper. I put loose leaf tea in his pants. Hilarious! He makes me laugh! The picture at the top of the page was one of our recent retreats at the retreat house. We had a blast. Such a fun group! We scheduled two more retreats, one for January and one for February, they were both filled up in two hours. We set out the newsletter at our sale on the 1st and it was a done deal! That day we emptied 176 bolts in four hours! Good job! 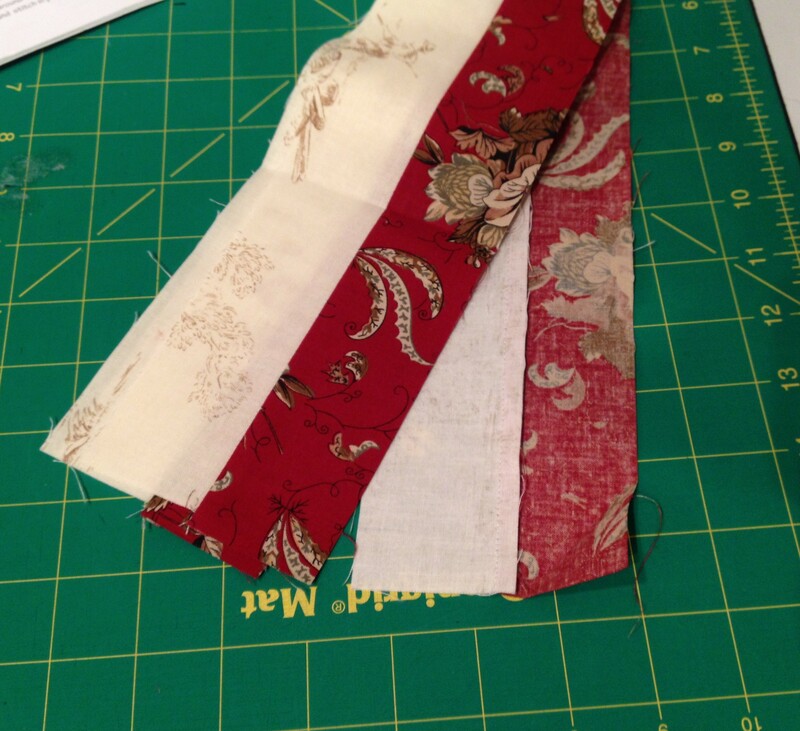 Bring in the New Year with new fabric! Well, that’s a super quick rundown of everything I can remember from December (about 2% of everything that happened…). I do have the last block for the mystery all done, I will work on editing that post and send it out tonight. Then we can get that gorgeous thing finished up!! I have a mug rug done for January, I just need to take some pictures and type that up. I think I can get that done on Friday. Thanks for hanging out with me. Stay warm and finish up those UFO’s while we’re stuck inside! Send me pics of what you are working on! 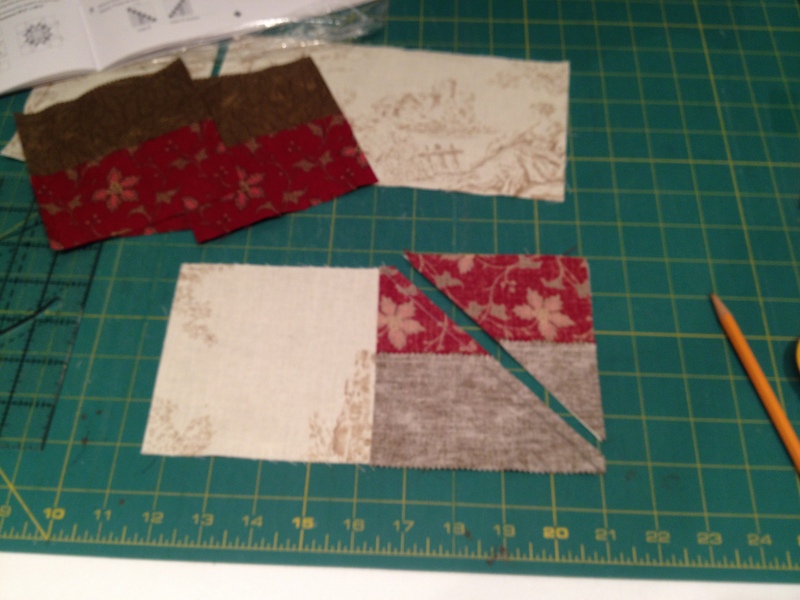 Mystery Quilt Step #4… finally!! I have to assume Bonnie Sullivan has a staff of capable employees to pattern test, cut, prep, post, remind, assist, edit… etc. Some one to help her look GOOD! I love her stuff and she is always “Bonnie-on-the-spot”. Me… not so much. 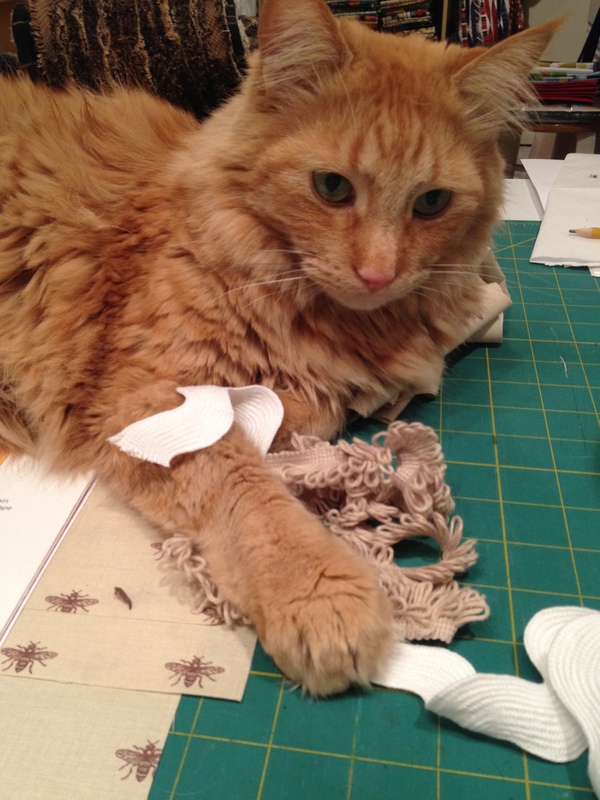 I have a FABULOUS staff, but they are busy and they merely laugh at me when I say I am running late with a project. It’s true… chastising and ridicule… that’s all I get… just ask them. I tell Brianna that Martha Stewart would never go through what I go through, and she promptly replies, “But you are no Martha Stewart.” Hmmm, true. So, finally, I have my blocks done for step four. We have a joke in the classroom that everything “takes five minutes” because it’s “super easy” but the truth is the only thing I can do in five minutes is warm up my iron. But these blocks… super easy. I think they are called “woodpile” blocks. If you peruse down the post, it will look like there are LOTS of steps, but that’s not the case. It is strip piecing five different simple strip sets, slicing into narrow strips, then sewing them back together into only 20 blocks; 8 are left to right stacked blocks, and 12 are right to left (reversed) blocks. So, to begin, cut your background (one color of background, or your mixed lights) into one 8″ strip x WOF (width of fabric), one 6 1/2″ x WOF, one 5″ x WOF, one 3 1/2″ x WOF and one 2″ x WOF. 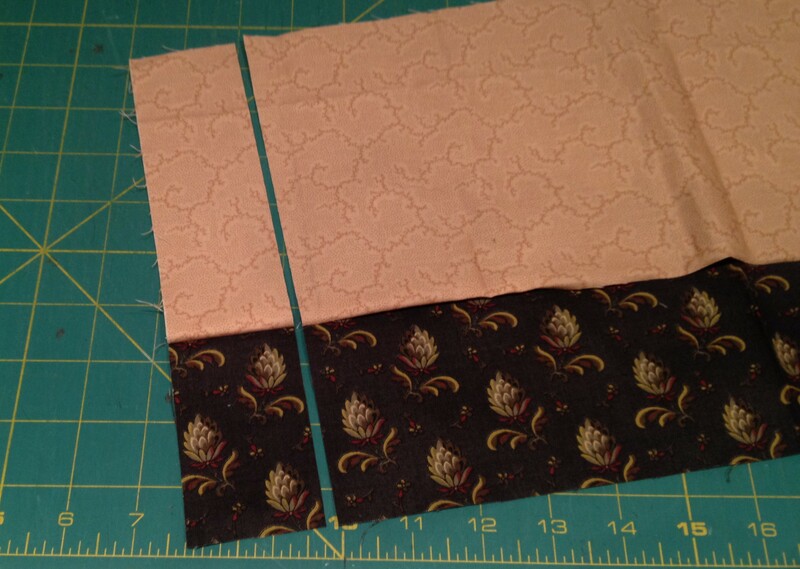 Next, cut a matching dark fabric the same way, one 8″ x WOF, one 6 1/2″ x WOF, one 5″ x WOF, one 3 1/2″ x WOF and one 2″ x WOF. You will also need a 9 1/2″ x WOF. I should mention that all of your background can be one color if that is what you like, but your “darks” should all be different. 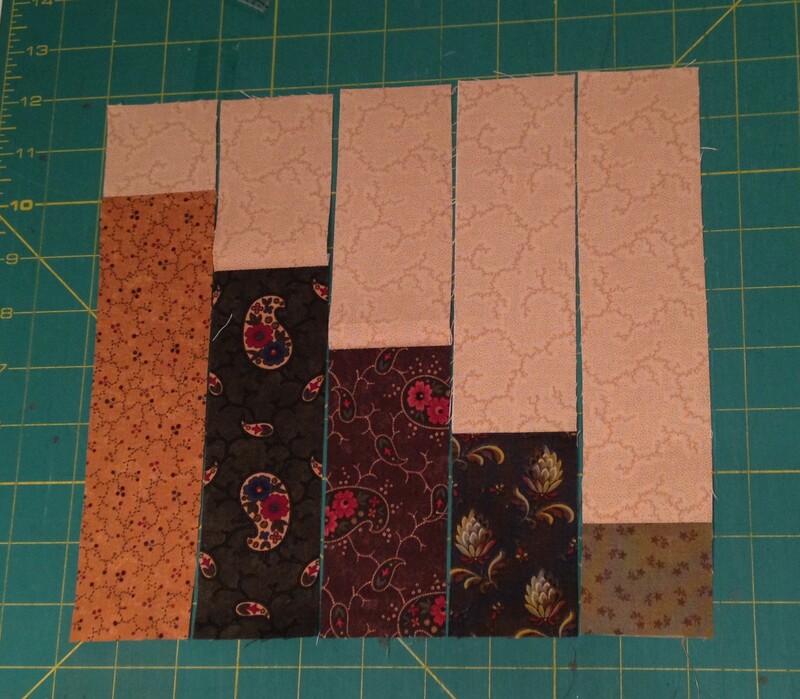 In fact, if you are using fat quarters and you have 21″ strips instead of the full 42″ in a strip, that will look terrific, but you’ll have to make two of each of the strip sets so that you have enough pieces. 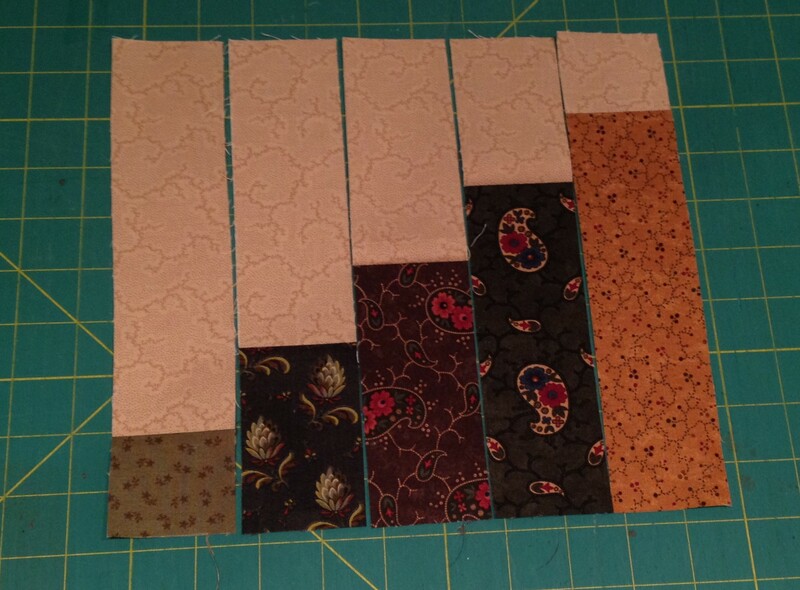 Now, with an 8″ strip of background and a 2″ strip of dark, sew these together into your first strip set. 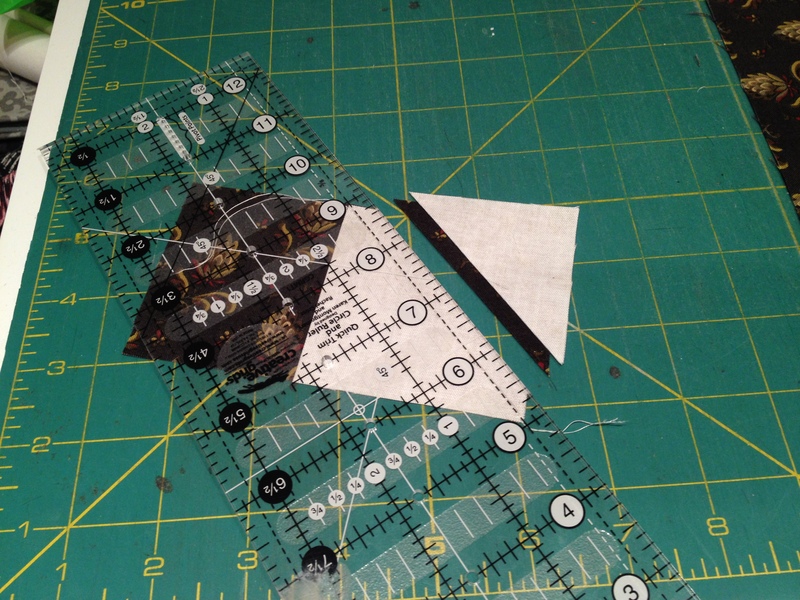 Ok, so, at this point you have three strip sets, that have each been cut up into twenty 2″ strips. You have two more strip sets to make. One is the 3 1/2″ background and the 6 1/2″ print and one is the 2″ background with the 8″ print. Finally, you will cut the 9 1/2″ strip into 2″ strips. Press. 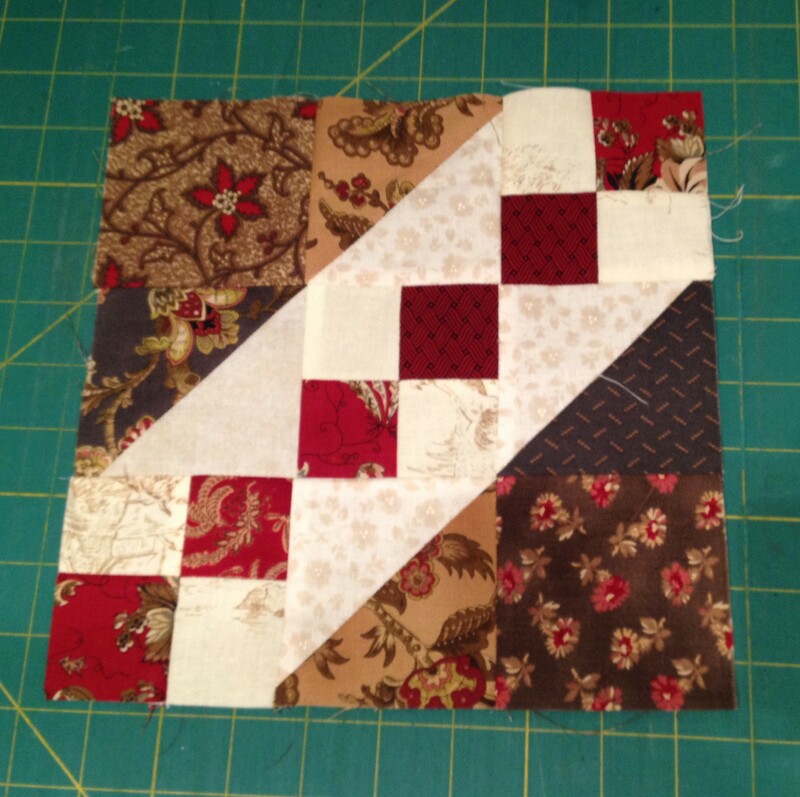 Blocks should measure 9 1/2″ x 9 1/2″ I hope you have fun piecing your blocks! They are super simple… just five minutes! After this we just have one more block… then we get to put this thing together!! See you soon! First let me apologize for my delay, I can’t believe it’s already Friday. I have been chasing my tail all week! I love the shop, the classes, the long hours… I especially love telling Brian I have to sew in the evening because “it’s my job”, but the one part about being a business owner I will always dislike is end of the quarter balance sheets, filing and quarterly taxes. Yuck!! But… all done. At least for now. 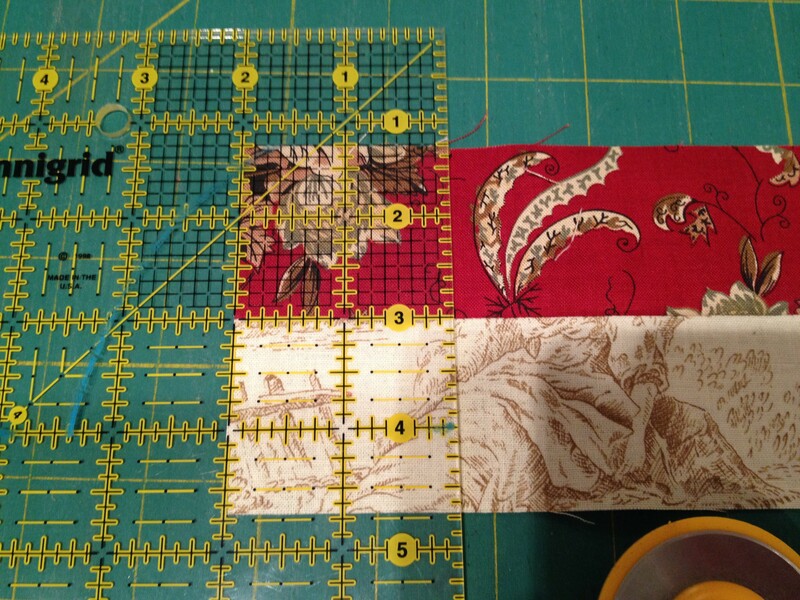 So on to more important things… quilting!! Time for our third step in our mystery quilt! As I mentioned before, this is a pretty simple project that you have some control over, because it is four different blocks that you will construct then put together in a beautiful configuration. And it’s such a wonderful way to use up all of those leftovers! Two weeks ago we started our floating stars. I hope you are done with them! Here is a picture of my friend Charisma’s: I love her colors with all of the mixed backgrounds! This time we are going to make a block called Jacob’s Ladder. 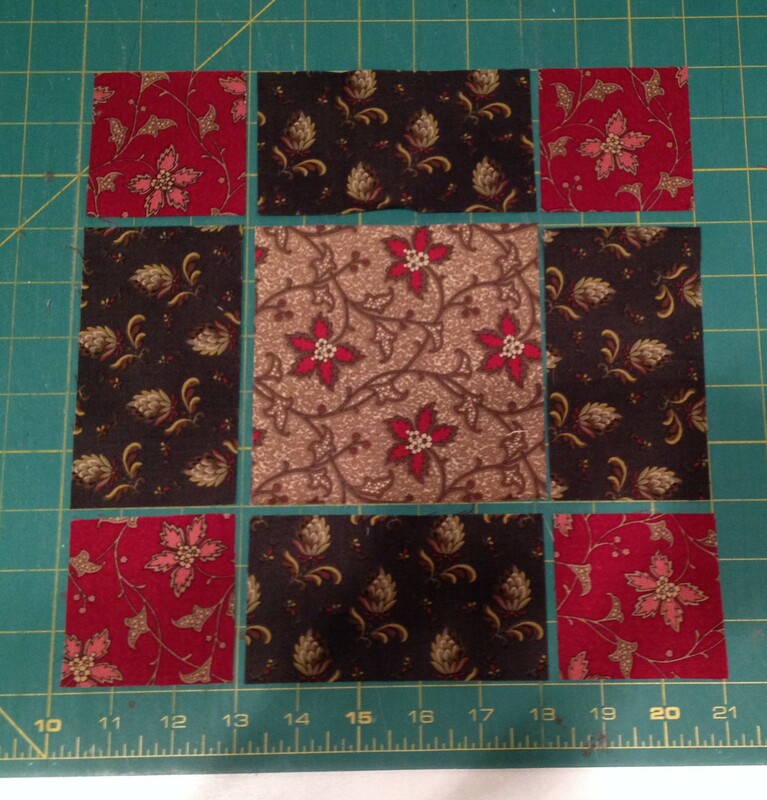 It is a simple block that is really a nine patch with a mixture of HST’s, squares and four patches. 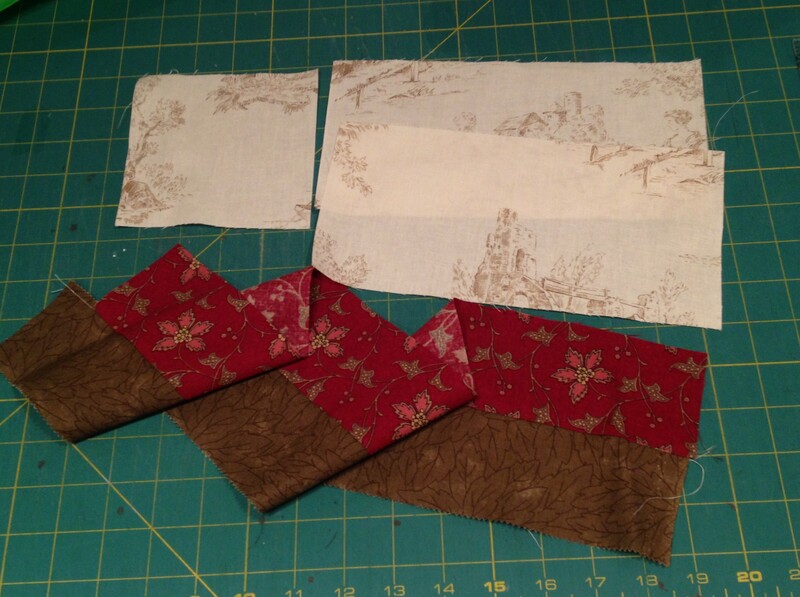 You will start by making the strip sets for the four patches. Cut 2″ strips of lights and 2″ strips of mixed darks. Sew them together lengthwise and press to the dark. You will need about 10 full length strip sets. I would make each one a different color so you have lots of mixed colors. Once they’re done, cut off 2″ sections. I think when you cut these you should measure with the ruler, not the mat. It is far more accurate. 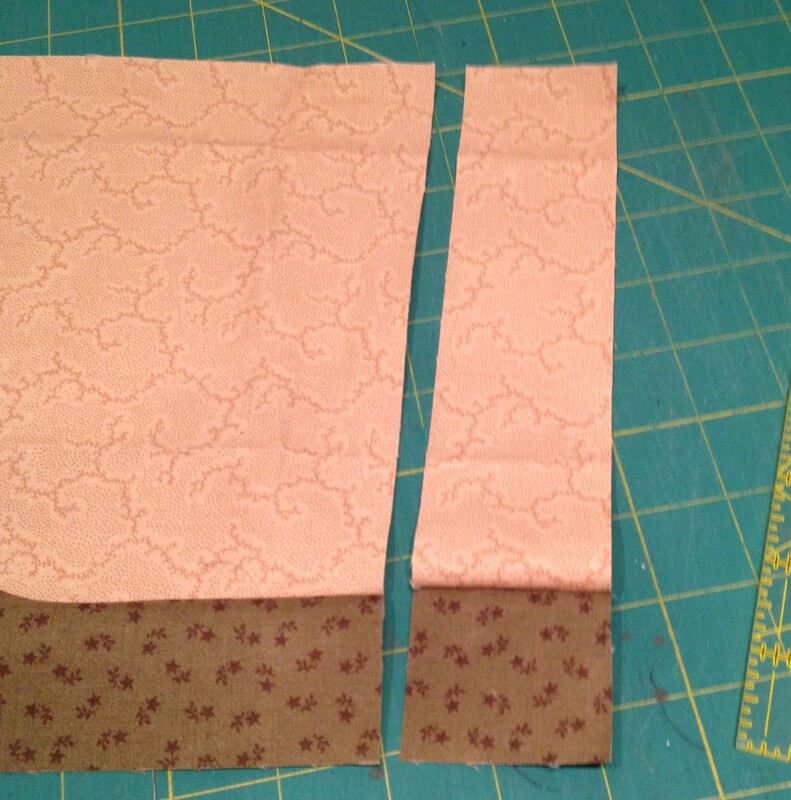 Keep cutting these sections until you have enough to make some four patches. You need alot of them… you will need three four-patches per block, so you need 96 four patches for your twin sized quilt, or 108 for your queen. That sounds like alot, but it goes pretty fast. I love making little four patches. I should mention they will be 3 1/2″ x 3 1/2″ when done. Remember pressing is important so your seams will nestle. 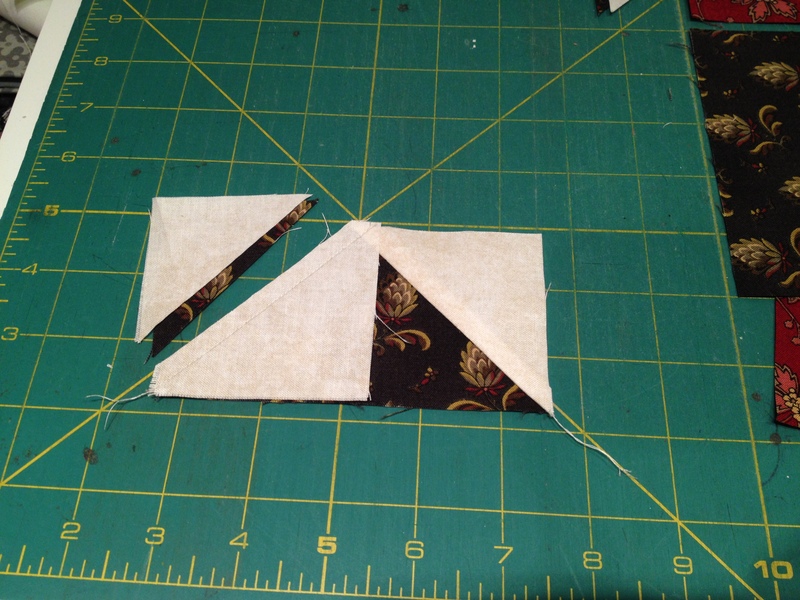 Next step is to make the HST (half square triangles). You need four per block. I start with a 4″ square of light and a 4″ square of dark and stacked them RST. 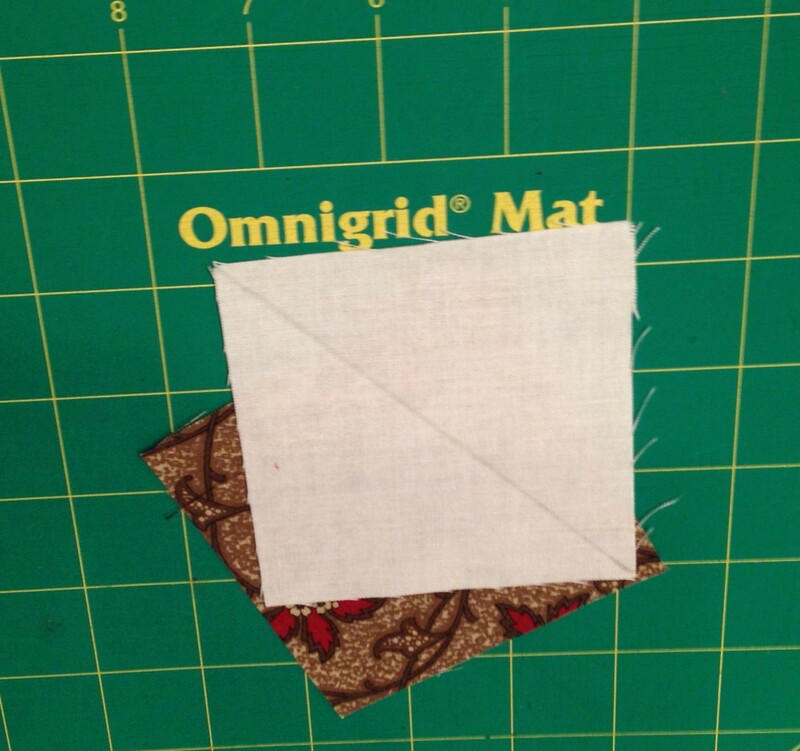 Draw a line diagonally, then sew 1/4″ from the line on both sides. Cut on the line you drew, the press open the two HST. You may have to trim them just a tiny bit. They should measure 3 1/2″ x 3 1/2″ when done. Your last step is to add the two dark squares. They of course measure 3 1/2″ x 3 1/2″. 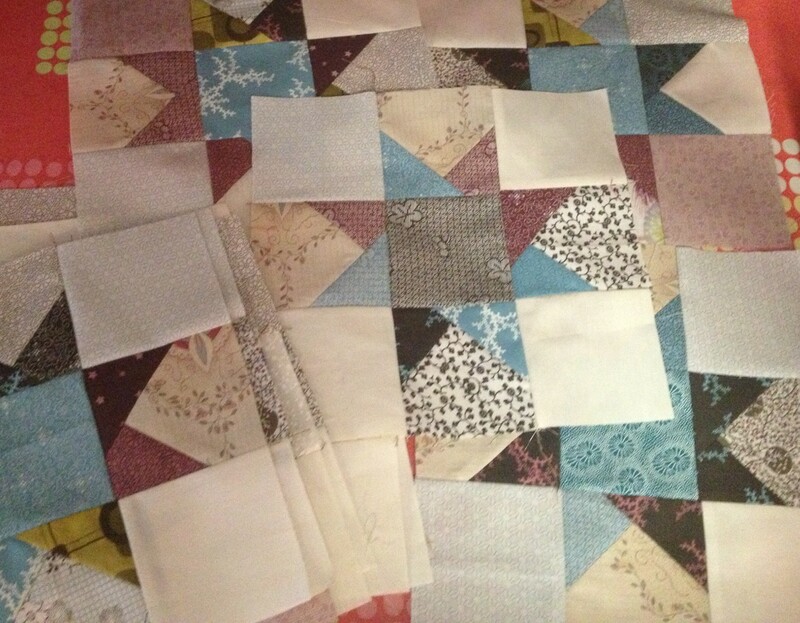 Place all of your pieces in a nine patch and sew the block together. Your blocks should measure 9 1/2″ x 9 1/2″ when you are done. You will need 32 of these blocks if you are making a twin, and 36 if you are making a queen. And that is that! A simple block made up of three simple units. Get busy… we’ll chat in a few days. Send pics!